Home » What’s the Quietest Garage Door Opener You Can Buy? What’s the Quietest Garage Door Opener You Can Buy? What’s the quietest garage door opener you can buy? Well, we review some of the best quiet garage door openers on the market. When selecting the best garage door opener for the home, nobody thinks about the noise that the door opener generates as it opens and closes. They give too much thought to the horsepower ratings, types of garage door openers, or where to get the best prices but forget to check the noise level of the model that they want to buy. A noisy garage door opener can be bothersome for sure, especially if you have a room above or close to the garage. For instance, if you just put the kids down for a nap, and someone decides to come home and open the garage door, the grinding may very well wake up the child. The same is true if you are trying to get to sleep at night in a family member comes home. If you’re going to buy a garage door opener it makes sense to invest your money in the quietest garage door opener available. But it’s not as easy as finding the quietest window air conditioner since the manufacturers of garage door opener don’t include the noise level of their models in the specifications. How can we know whether a garage door opener is quiet if we don’t have its “decibel rating”? This guide will help you find the best quiet garage door opener that will fit your needs. But before we go any further, here are our picks for the five quietest garage door openers on the market. Why is Garage Door Noisy? Have you ever asked yourself why your garage door makes loud noises every time you use it? Where does the noise come from? From the door itself or from the door opener? The right answer is 50/50. Loud noises when a garage door is being operated can be either be the door itself or the door opener. To determine where the noise is coming from, you have to disconnect the garage door opener from the garage door then operate the door without using the opener. If the door still makes the same loud noise then it is problem with the door. If there is no loud noise then you have to look to the opener. If you’ve determined that your garage door is your issues – check nuts, bolts, and rollers of the door to make sure all of which are working properly. If you’ve determined that the problem is with the opener, you should consider buying a new quieter one. Why? Because it’s not easy to turn a noisy garage door opener into a quiet garage door opener. Loud noises can mean your opener may have internal problems like a motor on its way out or an internal gear is falling apart, they all require a professional to fix. While the price for a good garage door opener isn’t expensive, it’s better to buy a new one rather than spending money on fixing an “old noisy friend”. If you truly want to eliminate your garage door opener noise, consider upgrading to a belt drive garage door opener as these are the quietest on the market today. What type of garage door opener do you need? What type of garage door opener do you need? Well, that question can be answered depending on what garage door you have. For the novice on garage doors, there are 5 main types of garage door openers: belt drive, chain drive, screw drive, direct drive, and jackshaft – which are separated by what mechanical drive is used to raise and lower the door. Each makes the different noise level when operating. Read more: What’s the best Belt Drive garage door opener to buy? The first type of garage door opener is the belt driven garage door opener which is by far the quietest opener on the market. Belt drive openers are much quieter compared to chain drive openers and screw drive openers. This makes them ideal for homes that have living areas above the garage. Townhomes, condos, split level homes, and anywhere else where the bedroom, or living area, is adjacent to or above the garage. Belt drive openers are quiet because they use a rubber style belt to run the length of the rail. This belt operates the same way that a chain would in a chain drive opener. But, because it is smooth running, there is no jumping of the door, and no metal on metal squeaking. The belt itself is a steel reinforced rubber like what you would find in steel belted tires. This gives the belt tremendous strength and durability. That’s why you should consider buying a belt-drive model if you want to install a quiet garage door opener in your home. You probably don’t know that the quietest air compressors on the market are also belt-driven compressors. Our favorite thing about a belt drive opener is that it runs very smooth and there is no swaying, as well as large amounts of vibrations when it opens or closes. If you buy a belt drive garage door opener a few years ago, you would have to pay a lot of money. But now it isn’t right anymore. Some companies, like Chamberlain, have created many high-quality models that have an extremely low price. The Chamberlain MyQ-enabled Whisper Drive Garage Door Opener, for example, is one of the quietest garage door openers on the market but also is one of the cheapest models you can buy. Chain drive garage door opener is by far the most common type of garage door opener. They are used in most home centers and department stores. That because chain drive openers are the least expensive openers and will last a very long time under normal circumstances. However, they can be much noisier than the belt-driven. The noise is made from the gearing, motor, and metal to metal contact. Chain drive garage door openers utilize a chain similar to the one that you would find on your bicycle and push the trolley that is connected to the garage door which pulls or pushes the door in the track. They do have the disadvantage of requiring adjustment, but this only needs to be done once or twice during the lifetime of a chain drive opener. For most chain drive garage door openers, the adjustment is relatively easy and only takes 10 minutes. A chain drive garage opener may not be the best choice if you’re looking for a quiet garage door opener. However, there is a model that was improved to be much quieter than most other chain drive openers – the Genie ChainMax 1000 Garage Door Opener – 3/4 HP DC Chain Drive Opener. This is one of the best chain drive garage door openers currently available. Screw drive garage door openers work a little bit differently than belt drive or chain drive garage door openers. A trolley is used along with a threaded-steel rod to rotate the motor to move the door. The pushing and pulling forces are much different compared to chain drive and belt drive openers. This is considered the fastest and strongest type of garage door opener. So it’s often the best option for nearly any garage door, even a very large and heavy door. Screw drive systems are mostly priced moderately and considerably less noisy than chain drive systems (though a bit louder than belt drive systems). However, their longevity, ease of installation and maintenance, and smooth operation easily make up for any small amount of additional noise. Further, they are less prone to seizing or breaking in extreme weather conditions, particularly in a very prolonged cold (which can be quite detrimental to belt drive performance). 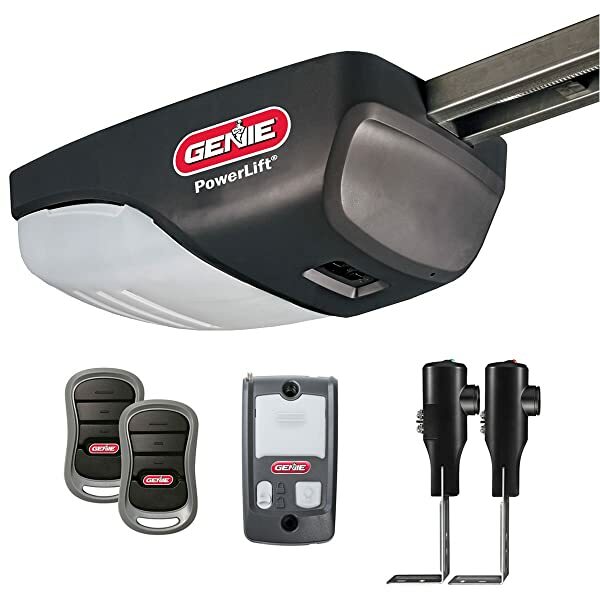 One of the best quiet screw drive garage door openers on the market is the Genie PowerLift Garage Door Opener – ½ HP AC Screw Opener. This is able to operate heavy residential garage doors up to 500 lbs in weight, and up to 8’ high with the use of extension kit (sold separately). We would highly recommend this model if you decide to buy a screw-driven opener for your garage. This type of garage door opener is also known as a wall mount garage door opener as the device is mounted on the wall to the right or left of the garage door. There are no rails connecting the garage door to a garage door opener, so the ceiling stays clear. Many people don’t even know this type of garage door opener existed. Jackshaft garage door openers are designed for garages with non-traditional ceiling detail. Garages with vaulted or cathedral ceilings, with a very low ceiling height or with obstructed ceilings such as those that are used for storing bikes, lawn mowers, garden equipment, etc are ideal for jackshaft openers. They’re also the best option if you want to install a security door for your garden sheds. Because a jackshaft garage door opener operates by turning a torsion spring rod instead of using a rail like a chain drive opener or a belt drive opener does, it generates less noise during the operation. In the past, it was used frequently on commercial doors but in recent years has been adapted for residential use. Many homeowners prefer to use this kind of opener for their garage doors because it looks more elegant than the ceiling-mount openers and is quieter as well. However, this type of openers is more expensive than most other types. The best jackshaft opener on the market is the LiftMaster 8500 Wall Mount Garage Door Opener. This opener uses a 24v DC motor that drives pulleys and cables that turn the torsion bar and raise the door. A direct drive garage door opener pulls itself along a stationary chain, almost like a tram, while pulling the door behind it using a J-arm. The motor itself functions as the trolley and travels along the track, raising or lowering the door. This type of openers is fairly quiet since the motor is the only moving part and the chain does not move as well as jingle during operation. Many direct-drive units are just as quiet as belt drives. Direct drive garage door openers are quite durable and don’t really need maintenance after many years of use. They are a bit more expensive than chain drive openers, usually around $50 more, depending on exact specifications. The best quiet direct drive garage door opener you can buy is the SOMMER 1042V001 Direct Drive 3/4 hp. If you buy this garage door opener right now you’d get a lifetime warranty from the manufacturer. What Size Opener Is Best For My Garage Door? There is no “one size fits all”. You have to determine how much horsepower (HP) does your garage door opener need. It will mostly depend on the size of the door. Doors that are 10 feet wide by 8 feet tall are single-car garage doors. Doors larger than this are considered double-car garage doors. Single-car garage doors do not require a heavier horsepower so a ⅓ HPS opener can handle most of them. Standard steel uninsulated double-car garage doors also can use a ⅓ HPS opener without straining the motor. If you have a wooden or insulated double-car garage door up to 16 feet wide and 8 feet tall, choose a ½ HPS opener. For doors that are more than 16 feet wide, purchase a ¾ HP opener. 1 HPS plus garage door openers are available for those with unusual requirements, though these are most often found in commercial situations. Most garage doors are heavy enough to cause serious injury and even death, so safety features on garage door openers are very important. It’s important for the opener to have the capability to automatically reverse if it detects that an object is blocking the door. Also, you will want a door with motion sensors that detect if a child or animal is moving in or out of the garage while the door is closing. Safety should be a key consideration when selecting a garage door opener especially if you have kids. All the models we reviewed below are equipped with the best safety technologies. Security features also are valuable considering the fact that the garage door not only secures vehicles and anything else stored in a garage, but may also offer indirect access to your home. Modern garage door openers have remote controllers that transmit a unique code to activate the opener. Look for a rolling code feature to prevent code theft and ensure that a neighbor’s remote control won’t open your garage. Each time you open the door remotely, a new, random code is automatically generated. The garage door opener will accept the new code the next time you operate the remote. You should buy a silent garage door opener from trusted US/Europe brands, like the Chamberlain, LiftMaster, Sear, Genie, or Sommer – they are providing garage door openers that integrated the best security features to homeowners. Adding a motion sensor security camera and a motion sensor solar light to your garage door can give your home more secure. Installing a garage door opener battery backup is an excellent way to defend against power outages that would otherwise block access to your garage. Most modern garage door openers are compatible with a battery backup system. The best garage door openers, like the Chamberlain Whisper Drive, offer built-in connectivity that allows you to monitor and share access to your garage from anywhere in the world. With the help of mobile apps, not only will your smartphone replace your garage’s remote control, but you’ll also get reminders when you’ve left the door open, easily manage who can access your garage, get notifications to your cell phone whenever the door is used, set rules for automatic opening and closing, and even monitor the garage via a video stream. Read more: what’s the best WiFi air conditioner on the market? Motion-Detecting Control Panel turns lights on automatically when movement is sensed and allows easy programming of remote controls, keypads and MyQ lighting accessories. 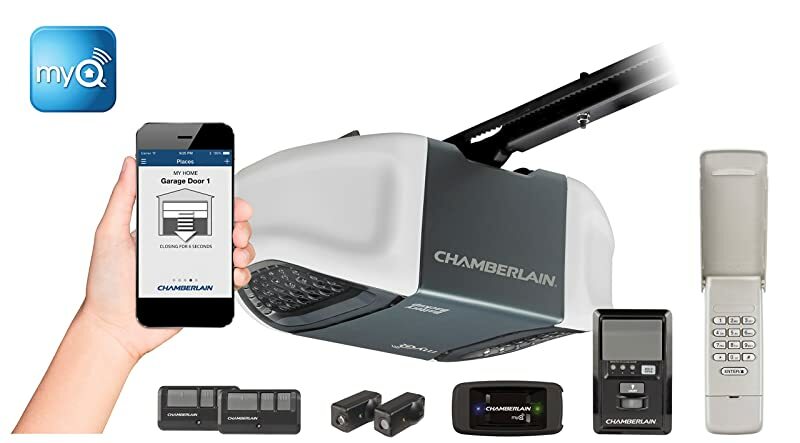 This bundle of the Chamberlain WD962KEV garage door opener and the CIGBU Internet Gateway lets you open, close and monitor your garage from anywhere with your smartphone. The Chamberlain MyQ-enabled Whisper Drive Garage Door Opener is the quietest garage door opener currently available. It has a powerful ¾ HP motor that will lift just about any garage door. We love the fact that you can connect this garage door opener with a phone app for long-distance control, as well as the fact that the door will secure itself if you forget to do so. The Chamberlain Whisper Drive comes with a Battery Backup system that allows you complete use of your garage during a power outage. The safety and security features will continue to operate as well, ensuring your family is protected in a power failure. The backup system supplies the opener with up to 20 opening cycles in a 24-hour outage period. This Chamberlain garage door opener has a reputation for quiet operation. The secret is in its belt system, which is similar to a steel-belted tire, with flexible steel cords woven into the belt. This gives the opener capacity for strength and near-silence. This system removes any potential need for the separate purchase of a noise-reduction kit. One of the best things about this quiet garage door opener is that it takes control to a higher level than other models with its door and light automation features. The internal control panel has a sensor for motion-activated lighting. In addition, door closing can be instant or set automatically for 1, 5 or 10 minutes. We give this feature a top-notch rating because, should you forget to close your door, your garage will secure itself. 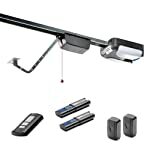 This garage door opener exceeds expectations in virtually every category of our garage door opener reviews. It’s the best truly belt drive garage door opener you can buy. The Sommer Direct Drive garage door opener is one of the best quiet openers on the market. It’s made by Sommer – one of Europe’s leading manufacturers of high-quality garage door openers and wireless control systems. When it comes to reliability, Sommer’s garage door opener is the best in its class. 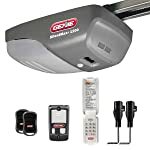 If you’re looking for a quality garage door opener that will last for at least 20 years, this is for you. And on top of that, this German company has a Support Center in the USA to provide their excellent customer services. This garage door opener uses Sommer’s Direct Drive innovative technology that the motor is the only moving part. The motor glides silently along the chain which is embedded in a sturdy steel rail. Therefore, it is extremely quiet and there is virtually no vibrations during the operation. Plus, because the motor is located at the door instead of the back of the opener it maximizes the power. There is no gear damage like with conventional garage door openers. This garage door opener is perfect for homes with living spaces above the garage. While this is an unconventional design, the 3/4-horsepower motor is strong enough to lift doors up to 550 pounds. This includes wooden double-wide doors and standard sectionals. The included rail is tall enough for a 7 to 8 feet door, and a separate extension is available for purchase if you have a 10-foot tall door. Like the Chamberlain MyQ-enabled Whisper Drive, this quiet garage door opener offers the best safety and security features to the garage door. It’s integrated a smart sensor that automatically stops and lifts the door if it encounters any person or object while closing. It also uses very secure 128-bit encryption radio technology (rolling code) for additional protection against home invasion. Unfortunately, the Sommer Direct Drive garage door opener isn’t integrated built-in WiFi and the company doesn’t provide much information about that. But we know this opener is actually compatible with your smart devices. By using the Gogogate 2 Wireless Kit (sold separately), you can control your garage door opener from the mobile app. This add-on is also able to work with almost any gate opener on the market. Overall, we think those great features above are enough to point out that the Sommer 1042V001 Direct Drive is one of the best garage door openers on the market. And it’s also one of the quietest garage door openers that we’ve reviewed. The Chamberlain WD1000WF WiFi Garage Door Opener has a 1.25 HPS motor and uses a belt-drive system to open and close the door. It’s as quiet as our top pick – the Chamberlain MyQ-enabled Whisper Drive, but it’s designed to lift a heavier and larger garage door. You should know that the benefit of a stronger motor isn’t limited to lifting bigger loads. A muscular unit typically lasts longer too. The opener comes with an exterior keypad, a backup battery, two remote openers, and an interior control panel. It also comes with all the rails, brackets, pulleys, and other hardware needed for installation. The included installation instructions are very specific, and Chamberlain offers helpful installation videos on its website. This quiet WiFi garage door opener lets you open and close your garage door using MyQ app on your smartphones. You can also control it using the Wink Connected Home Hub. MyQ app is very easy to use and works with other Chamberlain products. It also works perfectly with Nest Learning Thermostat. Quiet operation: The DC motor and belt drive allow for quiet, smooth operation and soft start and soft stop. Intellicode compatible providing state-of-the-art security for your home with maximum convenience. The SilentMax 1200 is the quietest garage door opener from Genie – a US company. It’s also one of the best-selling garage door openers in the US market. With a ¾ HP motor, it’s powerful enough for almost any residential garage door. One of the biggest disadvantages of this opener is that you’ll have to pay much extra money if you want to open the door by your phone. We mean it doesn’t come with a built-in WiFi sensor, purchasing the Genie Aladdin add-on is the only solution to enable that function. And the Genie Aladdin add-on is quite expensive. You’ll also have to buy the Genie GBB-BX Battery Backup to power your garage door opener in case of the power goes out. However, this quiet garage door opener really has a lot going for it. It offers an incredible opening speed, up to 9 inches per second, yet still has safety features for your peace of mind. The Safe-T-Beam system helps prevent accidents via an invisible infrared beam across the door opening, which reverses the door if an object crosses the beam of LED light. The beams are enhanced with diagnostic technology to alert you if a malfunction occurs. 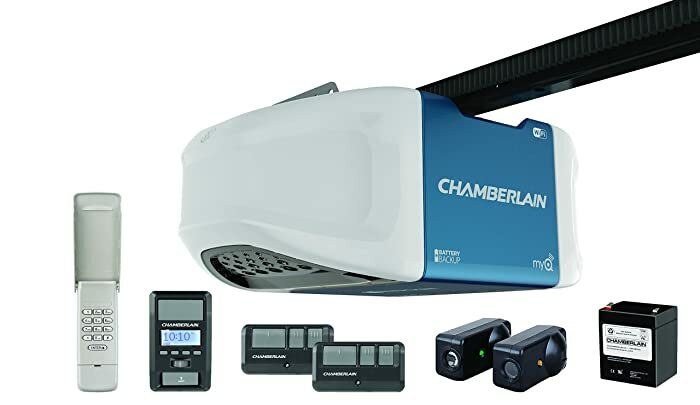 Even though we hate the fact that buyers will have to pay more money to get the features that are available in all of the Chamberlain’s garage door openers, we must admit that the SilentMax 1200 is one of the best garage door openers we’ve reviewed. Lift doors weight up to 650 lbs. It comes fully equipped with security+ 2.0, MyQ Technology and the Timer-to-Close system. 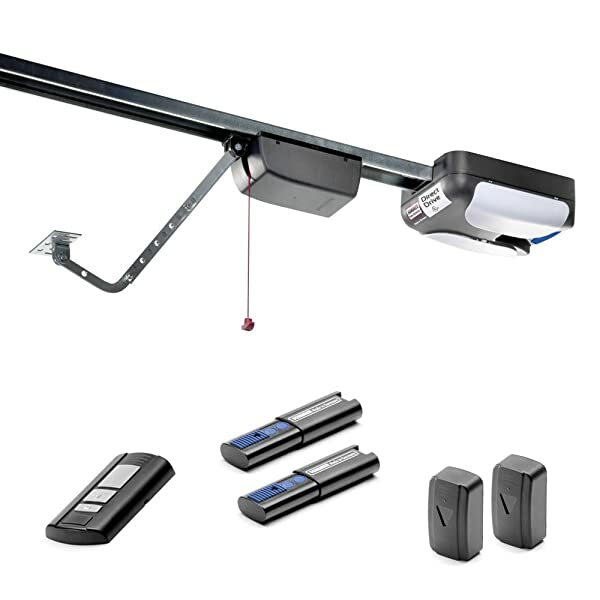 The Liftmaster 8500 Wall Mount Garage Door Opener is designed for garages with vaulted or cathedral ceilings, with a very low ceiling height or with obstructed ceilings such as those that are used for storing bikes, lawn mowers, garden equipment. This jackshaft opener is less common than other belt-driven and chain-drive garage door openers, but if use you it, you’d fall in love with it. It does not open the door quickly like the Genie SilentMax 1200, but it’ll take slow, quiet, and steady over quick and noisy. The Liftmaster 8500 mounts easily on the wall beside the garage door, and comes with a remote 200-watt light that can be positioned anywhere in the garage. Equipped with MyQ technology, the included MyQ Control Panel when paired with the LiftMaster Internet Gateway allows you to close your garage door or turn lights on or off using a smartphone or computer‚ from anywhere in the world. 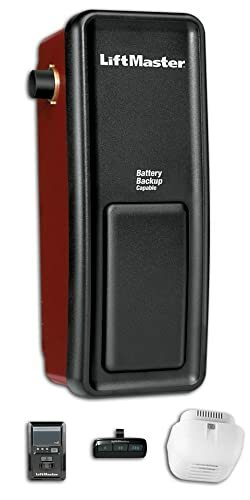 If you want to open this garage door opener when the power goes out, you have to buy the Liftmaster 475LM Battery Backup. This battery backup add-on allows you to open and close the door up to 20 full cycles when the power goes out.